I’ll cut to the chase: this book is one of the best introductions I’ve seen to the C++ language. I’ve read probably at least a dozen C++ books and I would say this would be the best place to start if you’ve never used C++ or even as your first programming book. There are some great C++ resources out there, but much of the material can be too advanced for a beginner and will probably scare you off before you get anywhere. With Beginning C++ Through Game Programming, Michael Dawson builds your knowledge from the ground up. The explanations are clear and easy to understand and no previous experience is required. You don’t even have to be a gamer to get value here as most of the games explored in the text are simple things like hangman or tic-tac-toe that anyone can understand. Dawson walks you through 10 chapters, each diving into a different aspect of the C++ language, starting simply and working up to more difficult topics. The chapter breakdown includes: types and variables, branching, loops, the STL, functions, references, pointers, classes, dynamic memory, and object-oriented programming. These topics really are the most fundamental building blocks of C++, and many are applicable to programming in any language. Lots of source code is shown, and the author explains each step along the way with an impressive amount of clarity. Even though I’d consider myself an intermediate to advanced programmer, I still found some things useful in this book, particularly the usage of the const keyword which was always somewhat confusing to me. All the examples are simple command-line programs, so you don’t need any special libraries, just an IDE that can compile C++ code, such as Visual Studio which has a free version on Windows. If you use a different operating system, you can just get whatever free IDE you want for your platform as this book uses all standard C++ code so any compiler should work. What I have found reading other books is that they may explain concepts well, and even show code, but sometimes either they don’t give enough context on how real usage would look or the examples are so complex as to be confusing for a novice. In this text, the author is clearly aiming to teach beginners and explains everything in concise terms without becoming too complex. In each chapter, there is another full example game shown, which could be typed into a computer and run. I did not actually test any of the code, as I’d rather just learn from reading, but I didn’t find any obvious errors. Each of these games are fairly straight-forward, with apps like guess my number, hangman, madlib, tic-tac-toe, etc. My one complaint is that the final chapter covers a full blackjack game, and this was much more complicated than the previous chapters and may be a bit too advanced. However, it still may be helpful to some to see what a more involved program might look like. While the title of the book is about “game programming” I wouldn’t say you need to be a gamer to gain insight here. 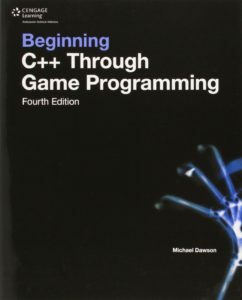 Though having some interest or familiarly with games can help, I’d still recommend this book for anyone interested in C++ or just wanting to learn programming in general. The author manages to cover the most key aspects of the language without burdening beginners with the more arcane constructs that will likely confuse you. Keep in mind, C++ is a beast of a language, and one book will not make you a pro overnight. After reading this title, you will still likely need other resources before you are ready to build your own apps or games. With gaming in particular, you will likely also need to learn how to use libraries, various APIs, etc. and none of that is covered here. So think of this as merely a light introduction, which will build a foundation your can bring to other more complex books. That said, I really can’t imagine a better book for people wanting to get started with programming in C++. This would work as a great first coding book for teenagers or even younger. I’m not sure there is a better beginning C++ book out there, and this is highly recommended. Although the Vulkan API has been available for about a year now, it was just at the tail end of 2016 that we started to see books published on the topic. 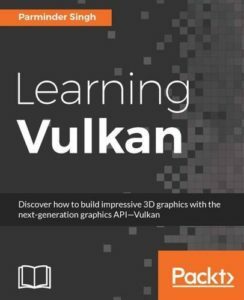 For me personally, I prefer learning from books over just reading documentation, and Vulkan Programming Guide is a fine effort. At 480 pages, it is a comfortable length, and manages to hit on a lot of major elements in the API. It is by no means comprehensive, as most of the coverage just shows function or structure prototypes (something you can likely find in the online docs) but there is at least some explanation of what each function does. I found useful the explanation of device limits (such as the maximum frame buffer size, number of bytes in a push constant, etc.) and how to query them, as I have not seen this touched in other texts. Sellers also does a great job of introducing synchronization concepts in one of the later chapters. This is absolutely essential for proper multi-threading, and I have not seen this in other books (at this depth). There is some discussion here and there to performance characteristics. Maybe not enough, but the author does attempt to give guidance on how expensive a particular call could be, or when it might hurt performance. Overall the book was solid. This will be my 3rd Vulkan book, along with a number of tutorials, and I felt there was relevant info gleaned from the text. 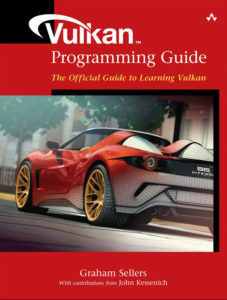 Vulkan Programming Guide has 13 chapters, each focusing on a key aspect of the Vulkan API. Inside these chapters are: a high-level overview of Vulkan itself, memory and resources, queues and commands, memory barriers and buffers, presentation, shaders and pipelines, graphics pipelines, drawing, geometry processing, fragment processing, synchronization, queries, and multipass rendering. Not a bad mix of topics. I don’t think anything major was left out, however, some of the coverage could be more fleshed out. While there was great detail on some things. For example, showing SPIR-V disassembly code, other topics were only given a cursory look. In particular, there is very little source code in the book. While the author goes to great lengths to show structure and function prototypes, there isn’t a whole lot of code showing actual usage. While it’s debatable if this is necessary, I would find more code examples to be useful. To be fair, the code that is shown looks good, there just needs to be more it. All in all, I feel the book is solid and, considering Vulkan is relatively new and there aren’t that many texts available, it’s not a bad choice. One thing to note: I would recommend you start with Learning Vulkan by Parminder Singh. Learning Vulkan is a much more approachable resource, and I found it a little easier to follow. While Vulkan Programming Guide is more in-depth in many cases (in terms of the API spec itself), Learning Vulkan has a lot more C++ sample code, and may be more useful in that respect. In any case, I would buy both books because there are unique advantages in each one. Could Vulkan Programming Guide be improved? Sure. But it’s not a bad book and if you are getting into learning Vulkan today you’ll really need any and every resource you can get your hands on, and this should certainly be on your shelf. Learning Vulkan by Parminder Singh is an excellent foray into the Vulkan graphics API and quite a competent book. The text is a reasonable 466 pages, and packs a lot in there. Singh covers all the basics of using Vulkan and goes into great detail at each step of the way. Not only is there actual C++ code shown (a lot of it), but he explains each API call and what objects to pass it, a breakdown of each object structure and what it does, what’s valid (or invalid) for data you can put in, and so forth. I have not read the official Vulkan Programming Guide yet (that’s coming next) so I’m not able to compare them here. However, this book is an absolute treasure trove of information, and presented with clear context, not just a copy and paste of API docs. While the book is not particularly long, the author does manage to cover a good amount of ground. Of the topics included are: getting started with the LunarG SDK, initializing the API, debugging, command buffers and memory management, allocating image resources and the swapchain, buffers, render passes, framebuffers, working with SPIR-V shaders, pipelines and pipeline state management, descriptors and push constants, and finally drawing a textured polygon. I’m still getting acquainted with Vulkan myself, but this does seem to touch on all the fundamental topics to get started with the API. It really seems like Parminder Singh knows what he is talking about and feel I learned a lot finishing this text. One thing to keep in mind, this is not really a book about graphics programming techniques, but rather a survey of the API. Meaning, unlike Frank Luna’s DirectX books, you won’t have any cool demos to showcase at the end. Through the whole book you’re basically just working with the initialization of the Vulkan API, though you do end up with a colored triangle and finally a textured cube. This is honestly fine, and just what is needed at this point in the life of Vulkan. Flashy demos are cool, sure, but once you have the fundamentals down, it shouldn’t be hard to apply that knowledge, or port techniques from other APIs. I will note, however, that I wish there was more discussion into the performance cost or characteristics of parts of the Vulkan API. For example, sometimes there are multiple ways to perform an action (like with uniform buffers or push constants getting data into a shader) and there wasn’t much explanation as to when to do one thing over the other. This is not a huge concern, as there are lots of articles online covering these types of things and it seems the book is there to get you familiar with the concepts and data structures to allow you to do your own research later. Certainly, I still have a lot of questions but I can’t imagine a more thorough book as an introduction to this relatively new API. Some familiarity with older graphics APIs will probably help, but I don’t think it’s absolutely needed. In my opinion, if you are wanting to learn graphics programming today, you might as well just jump into Vulkan (or DirectX12, if you prefer) as the industry will quickly adopt these new, lower-level APIs and you will be setting yourself up for the future. Do understand, though, that Vulkan is extremely verbose and needs something like 1,000 lines of code just to get a triangle on the screen. So stark beginners may be put off by that complexity. And you should definitely have good working knowledge of C++ before getting into this. With that in mind, however, I think that Learning Vulkan by Parminder Singh is a great place to start to delve into this exciting new world of Vulkan. Well worth reading. 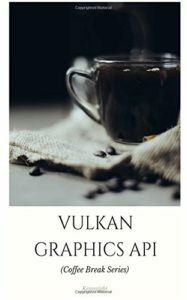 Vulkan Graphics API: in 20 Minutes is a short, no-nonsense, introduction to the Vulkan graphics API. Though the title of the book says “20 minutes,” I believe I spent somewhere between 1 and 2 hours to finish it (though I admittedly read pretty slow). This is the type of book I wish there were more of: something short and sweet as a brief intro to get your feet wet. I feel many programming books can be daunting at 600+ pages, so it’s nice to find something you can complete in one or two sittings. So what is actually covered in this little book? Basically it shows the basics of how to initialize the Vulkan renderer and draw a triangle on the screen. The author does not use any additional libraries, so it’s only showing the Vulkan API itself and some boilerplate Win32 code for opening a window. Though I had already been reading about Vulkan previously, and didn’t find any new material here, I could see this as a decent first step in learning the API. To be honest, Kenwright does not really provide any deep explanation of the concepts presented. It’s basically just showing some of the common function calls and the structure to set things up. You could easily find similar code online (at various sources) for displaying a triangle in Vulkan. Even so, I still think the text holds value and may be more accessible than some of the larger (and more costly) Vulkan books that do provide more detail. This is sort of something that would be useful if you’ve really never worked with the API before and just want to see how the code looks and if it’s something you’re interested in prior to researching further. All in all, I can’t really fault Vulkan Graphics API: in 20 Minutes too much. While there were a couple typos and odd use of the English language, overall the book was concise and coherent. It provided a cursory look at a new, exciting, graphics API and it did with with a meager time and money investment on behalf of the reader. While you can find basically the same material online for free, I still personally enjoy learning from books and think the format may click for some people better. It only really scratches the surface, but as a short “first intro” book it’s not bad. 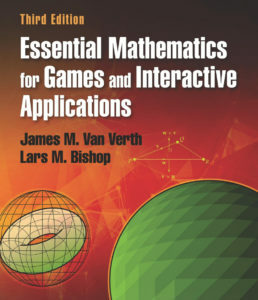 Essential Mathematics for Games and Interactive Applications by James M. Van Verth and Lars M. Bishop is a quality math book if I ever saw one. Strangely, the first edition came out in 2004 but the book was kind of off my radar until recently. This third edition was published in 2015 and seems very current. The authors here do a great job of explaining the material properly. I felt like they created a great foundation for learning these complex ideas and I appreciated the quality and readability of the code samples. The book starts with an overview of computer number representations, and goes into detail with the IEEE 754 floating-point standard. At first I assumed this was unnecessary detail, but actually it’s pretty useful to understand and a good base to build on. They continue with vectors and points, linear transformations and matrices, affine transformations, orientation (including matrices, Euler angles, axis-angle, and quaternions), and interpolation (linear and curved). In the next section they transition to more graphic oriented topics such as: viewing and projection, geometry and programmable shading, lighting, rasterization, then a random chapter on… random numbers, and finish off with intersection testing and rigid-body dynamics. Just looking at the table of contents is sometimes not enough to get a feel for the quality of the text, so I will reveal more. The beginning parts are really exactly what you’d expect for a game math book. The basics of vectors, matrices, quaternions, etc. are the bread and butter for a 3D programmer. The coverage here is solid and great for a beginner. Advanced readers may not find any surprises, but it’s still a good refresher. The interpolation chapter I found interesting, especially the detail into different types of curves and splines . 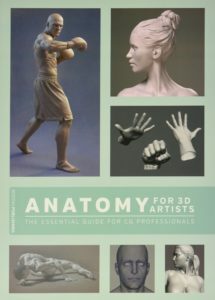 This could be immediately useful for coding a skinned character or animating a camera in a game. Viewing and projection were given adequate coverage and are essential to anyone wishing to code a graphics engine themselves. The next chapter was particularly long and explained the programmable shader pipeline to great effect. The authors explained everything from color representation, vertex attributes, drawing geometry, fixed-function versus programmable, vertex and fragment shaders (aka pixel shaders), and texture mapping. Really a great introduction for anyone wanting to learn to code shaders themselves. Then they move onto lighting and go into the basic types (point, spot, directional, and ambient), surface materials, per-vertex and per-fragment lighting, combining with textures, and a few small sections of more advanced topics like normal mapping, physically based lighting, HDR, and deferred shading. Next up is rasterization, which was an awesome chapter that explained (in epic detail) how rasterizers work which I feel does help when you know what’s going on behind the scenes. I don’t know of many other books that explain this part of the pipeline so well, so this was much appreciated. The random number chapter was also quite informative. It’s easy to just call a function that spits out a number and not actually understand what’s happening. I found this portion of the book to be a nice surprise. Intersection testing was covered near the end, and it was one of the longer chapters. Almost anything you could think of was here: finding distances from lines and points, sphere/ray/plane intersections, axis-aligned bounding boxes (AABBs), swept spheres, object-oriented boxes, triangle intersection, and a simple collision system. Finally the book closes with a chapter on rigid-body dynamics. I actually purchased my copy mostly for the rigid-body material and I felt I learned a few useful things. Of course, it was only one chapter but some of the explanation was better than whole books I’ve read on physics. Certainly it gave me a few things to research further, and I appreciate that. Overall I would say that Essential Mathematics for Games and Interactive Applications is an almost flawless textbook. I may be a great place to start for a beginner, and even intermediate to advanced readers may learn a thing or two. Some of the other game math books I recommend I read so long ago it’s hard to make a direct comparison. But this title is certainly up there with the best. I would wholeheartedly recommend. 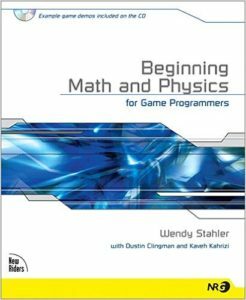 Beginning Math and Physics for Game Programmers by Wendy Stahler is the kind of book I like. The title is straight-forward, and the content actually delivers what it claims. I’ve read a number of game development math books but I find that many of them expect a college level mathematics background, or at least some intermediate knowledge already. Not here. This is a book that is accessible to stark beginners, and I’d even recommend it to high school students. Stahler’s text covers all the basics for both 3D math and physics. Topics include: points and lines, geometry, trigonometry, vector and matrix math, transformations, unit conversions, motion, Newton’s laws, energy and momentum, collisions, and, finally, rotational motion. Clocking in at around 500 pages, there is enough space to delve into each area with adequate coverage. I found the explanations to be very clear and geared to novices. The author uses lines like: “The fancy name for moving objects in these directions is translation.” While advanced readers may feel somewhat patronized by the language, I actually think this is a great approach for beginners. 3D programming is not easy, but sometimes the arcane conventions used in more advanced books can be off-putting to people just getting started. One thing I should note, I don’t typically test code samples or verify the accuracy of formulas while I’m progressing through the text. What I expect from the book is to gain a high-level conceptual understanding of the material in order to better grasp the subject matter. When it comes to the actual programming implementation, I will just use the book as a reference but usually find the formula online on Wikipedia or similar sites. I realize some people expect every code sample to work, but I’m not one of those people. It’s the concepts themselves that are important to learn and once you understand you should be able to know what to search for or even implement the code yourself. One aspect I appreciated was that most of the concepts started with an explanation first in one dimension, then two, then three. This was especially helpful as it’s conceptually simple to understand something like motion in only 1 dimension and it gradually builds upon that. Some other books jump straight into higher dimensions right off the bat, and that may be difficult to some without prior knowledge. The author also provides ample diagrams, graphs, charts and sample code. She also makes effort to show unit conversions when needed, and emphasizes differences between easily confused units. Wendy Stahler’s book is, however, somewhat dated being originally published in 2004. While the core material is still relevant, and hasn’t really changed much in those years, some of the samples are written for antique computer systems. For example, for one demo included on the CD-ROM she recommends that the “minimum system requirements for the program are a 700MHz processor, a graphics card with 8MB of memory, and 64MB of RAM.” Those specs would have been laughable even in 2004, when the book originally came out. However, it is humbling to consider my smart-watch has specs that would put the machine those demos were build for to shame. Overall I enjoyed the book, even with the caveat the nearly all the material was a refresher for me. If you are already a professional game developer, then there probably won’t be much to learn here. I’ve been kind of on a binge of game math and physics books, so I figured I’d give this a shot. I also like to have material to recommend to people new to game development and I find it interesting to read books of different levels to get a broader perspective. If you are just starting out, this may be a nice resource to get your feet wet before graduating to the more complex, but much better math books out there. 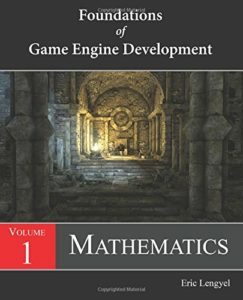 I’ve always been a big fan of Eric Lengyel, from both his work on the C4 Engine (and now the new Tombstone Engine) and his previous math book, Mathematics for 3D Game Programming and Computer Graphics, which is on it’s 3rd edition and is one of the definitive texts in the genre. This latest book, Foundations of Game Engine Development, Volume 1: Mathematics, I feel does it again and is well worth reading. The text, which clocks in at around 200 pages (short for a technical book) actually has a decent amount of information crammed into those pages. Lengyel breaks it up into 4 chapters, each focusing on a different aspect. Chapter 1 starts with vectors and matrices, then continuing to transformations, next to geometry and the finishing chapter on advanced algebra. The first 3 chapters are about what you’d expect from a game math book, but explained clearly and succinctly. Early in the book, when discussing vectors, the author states: “Loosely speaking, the dot product provides a measure of how much one vector is like another.” Though it seems obvious now, I’m not sure I’ve ever heard it explained quite as clear before. Much of the rest of the coverage in the first 3 chapters feels like this. While it may be a refresher to many, it’s like seeing some of these concepts in a new light just from the stellar delivery. As I mentioned, chapters 1 through 3 cover the basics, that most game programmers are likely familiar with. Vector and matrix operations, transformation spaces, finding relations between points, lines, and planes, etc. I’d consider this to be a good refresher for people at least somewhat familiar with game mathematics. Though I could also see it as an decent introduction for some, there may not be enough hand holding for a complete novice. However, in chapter 4, Lengyel dives into new territory with Grassmann algebra. Though the math is very old, I’m not sure I’ve ever seen it covered or mentioned in any of the popular game math books I’ve read. The concepts are actually quite interesting, and seem to tie together some different areas that originally seem disparate. To be honest, I think I’d have to read this chapter a second time for the concepts to really sink in. It did make some sense but, being somewhat new material to me, I wasn’t sure how I’d immediately apply the knowledge. That said, I applaud the author for bringing something new to the table and I can’t imagine it being described better. One part I really did appreciate were the code listings, shown in real C++ code that, while I did not type them in a computer and compile, seem like they would be ready to basically lift off the pages and use in a project. I also very much liked the coding style, which felt clean and modern, unlike some other books I’ve seen where it looked like the code came from a 1980’s mainframe. Overall, I very much enjoyed this book. It was able to cover basic game mathematics in an extremely clear and concise manner, and introduce new concepts along the way. I think this would make an excellent edition to any game development library. While the book was refreshing at only 200 pages, that brevity meant that some concepts could have been in more depth, and other topics weren’t covered at all. For more thorough coverage, I’d look to 3D Math Primer for Graphics and Game Development by Fletcher Dunn or to Lengyel’s prior book, Mathematics for 3D Game Programming and Computer Graphics. That said, whatever your skill level, I think Foundations of Game Engine Development is a worthy read. This book was quite an interesting read. Though a book of math and physics sounds like it would be boring, I found the text to be pretty engaging. At 688 pages, it’s not the longest technical resource, but the authors manage to pack a good deal in those pages. Of course, there is a lot of math in here, but that’s not all. Even some random topics like mazes and game theory pop up near the end. I really did enjoy the book and it seems worthwhile. Some of the areas of focus include even basic number representations, arithmetic, algebra and trigonometry, vectors and calculus, to mass and acceleration, collision detection, force and motion, friction and more. Finally, in the last section, the authors cover some tangential topics like tile-based games, mazes, game theory and AI, even search techniques. Really, a good roster. One of the main reasons I purchased this book, aside from general interest, was to gain some knowledge to apply to a custom physics engine. While that’s still (in my mind) a debatable goal, I do feel like Mathematics & Physics for Programmers has helped, at least with the general concepts. Unfortunately, I did not try to implement any of the equations or pseudo code from the book, so I won’t comment on the accuracy of the code. It’s possible there were errors that I did not notice. I typically don’t base my implementations directly from books. I use the books to understand the big picture, to get a sense of what’s possible, and to understand the vocabulary and terms that I need to search for. Then I’ll find resources online when it comes to writing the code. What I will say, though, is that the text is not as good as the other big 3d math books, specifically 3D Math Primer for Graphics and Game Development by Fletcher Dunn or Mathematics for 3D Game Programming and Computer Graphics by Eric Lengyel. For sure, if you are only buying one or two math books for game development, get either of those first. However, if you are like me and you’ve already read the popular books on the topic, this isn’t such a bad choice as a refresher or to round out your knowledge. Game Programming Algorithms and Techniques is one of those books that tries to be as general as possible, and I believe the author was successful in that. Too many books target one specific piece of software or even one particular version of a framework and end up becoming dated rather quick. However, the core ideas in game development have not fundamentally changed in a while. Sure graphics get better, and there are more complexities to working with modern hardware, but the programming algorithms themselves are still very much the same. Sanjay Madhav starts the book with an overview of some classic games, how a game loop works, handling timing in games, and the idea of game objects. Next he discusses 2D games, sprites, scrolling, and tile maps. There is a quick chapter on linear algebra. Then the author continues with a treatment of 3D graphics, including coordinate spaces, lighting and shading, visibility and transformation. Handling input is covered as is sound. There is a chapter on physics, which I much appreciated, and then some quick coverage of cameras, artificial intelligence, user interface, scripting, and networking. Finally, the book closes with two example projects. The author does a great job of explaining complex concepts in easy to understand language, especially in the math and physics chapters, which could be confusing otherwise. One of the pieces that I gained a lot from was the explanation of mouse picking 3D objects, which was described beautifully and made a lot of sense. The chapter on scripting languages was also helpful and relevant. Overall I enjoyed the book, and think it would be helpful to beginning programmers, or experienced coders in other fields looking to get into game development. I feel that for intermediate to advanced game programmers, much of this book will be a review. Not to knock the book for that, though, I think it’s a great book if you understand the audience it’s aiming for. I mean, there were even a few bits of information that were new to me, however much of the book was about stuff I’ve seen before. That said, I do like to read texts of various levels, and even beginner books can help you look at familiar problems in new ways. So I think it’s very much worth reading, especially if you are just starting out in game development.